“Charge It for CHARGE” is the primary online fundraising campaign of the CHARGE Syndrome Foundation. Become a fundraiser or donor. You can use e-mail and social media to raise funds for the Foundation. Your support helps fund research, outreach, and biennial international conferences. You can make a difference! Click here for a quick tutorial on how to set up your fundraising page. 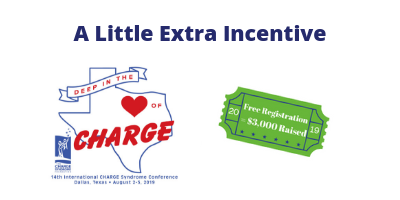 From 8/15/18 to 6/1/19, you can earn a free conference registration for every $3,000 raised through CIFC. The more you raise, the more free conference registrations you earn! We hope this Little Extra Incentive will encourage everyone to give CIFC a try and help get you and your families to conference. *Anyone who participates in Charge It for CHARGE as a part of a team will qualify for the incentive based on their individual fundraising efforts.